Melodic shaman Todd Rundgren is back after a ten year hiatus with a brand new album "Liars", a record chock full of deeply personal (and often socio-political) lyrics seamlessly melded with profound musical statements. Featuring canned synthesizer sounds, programmed drum machines, and sporting techno and ambient influences, many of the songs comprising "Liars" easily exceed the five-minute mark, thus proving -- once again -- that the man is simply unwilling to write concise, 3-minute pop songs; self-indulgence, personified. For diehard fans only. What you have just read is, of course, a complete farce, a joke, a parody. Let's face it: a lot of people have had a difficult time keeping up with Todd Rundgren over the years, and many would like nothing more than to witness a return to his glory days of Top 40 dominance, 3-minute perfect pop symphonies, and worldwide televised appearances. Keep holding your breath -- it ain't gonna happen. Much like bebop/fusion pioneer Miles Davis, Rundgren generally refuses to return to his past for inspiration, instead focusing on the here-and-now, choosing to incorporate elements relevant in today's musical world into his own uniquely melodic point of view. A progressive artist in the literal sense of the word, Rundgren continues to hone and develop the craft of songwriting -- sometimes brilliantly, sometimes with results that can Only be described as 'challenging' -- always in keeping with the spirit of artistic truth and unhindered musical communication (something many contemporary songwriters would be wise to emulate). Rundgren -- an acknowledged master melodicist and musician -- has never sounded better, more assured, or as relaxed as on "Liars". Each and every one of the songs comprising "Liars" contains melodic and rhythmic elements that, frankly, you just don't hear in modern popular music much anymore. Rundgren's vocal melodies have always been breathtaking, unique, and incredibly captivating, and his advanced sense of rhythm – sometimes unnerving, always interesting -- is well intact on "Liars", leaving perceptive listeners with a wealth of potential discoveries. Vocally, Rundgren is a study in passion. Always considered a top-tier rock vocalist, Rundgren outdoes himself here -- age has tempered his voice with an unsurpassed level of maturity, grace and, yes, soul. 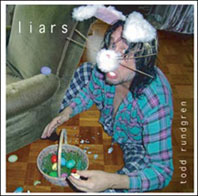 Rundgren's mastery of the recording studio is in full evidence; "Liars" has a clean, crisp overall sound, wonderfully mixed to highlight the many unusual twists and turns prevalent in his often-complex compositions. Playing all of the instruments on an album is nothing new for Rundgren, and his highly-refined chops -- on a multitude of instruments, no less – sets the sonic foundation for "Liars". Fans of his blistering electric guitar work -- fully realized during Utopia's 70's prog-rock heyday -- may be slightly disappointed to find relatively few guitar solos on "Liars". They ARE there, however subtle; one listen to the religious-right damning "Mammon", or the outro of the upbeat techno-rocker "Living", will confirm his status as one of the most tasteful lead guitarists in the pantheon of rock music. Interestingly, obvious studio edits (such as the chopped-up cymbal hits in the gorgeous ballad "Past") complement, rather than detract, from the magic of the music. Lyrically, "Liars" addresses a wide range of topics: the way males and females continue to stereotype one another; the apparent lack of soul among today's popular artists; aging and death; living in the past; and the eternal quest for love, truth and self-understanding. Many of the lyrics reflect a somewhat socio-political stance (such as "The Wondering", a brilliantly inspired look at the botched 2000 USA presidential election), but, in my humble opinion, the lyrics comprising "Liars" are much more self-reflective: the personal, deeply introspective illuminations of a man entering -- with trepidation and perhaps a measure of fear -- into the beginnings of his golden years (Rundgren is in his mid-50's). Opening with the techno-influenced "Truth", Rundgren sets the musical and lyrical tone for the album in spectacular fashion, utilizing pulsing drums and ambient sounds to propel the song forward. Truth can, indeed, be many things to many people, and Rundgren addresses this universal concept via a fresh and intriguing vocal melody. The blending of such disparate elements -- such as actual melodies and techno soundscapes -- is similar in approach to Madonna's "Ray of Light", itself a touchstone in the ever-evolving world of modern rock music. "Truth" proves -- once and for all -- that modern, techno-based music need not be coldly sterile nor melodically mundane. Rundgren sets a deeply soulful mood -- one that runs throughout the entire album, in fact -- with the second track "Sweet", a down-tempo number anchored by a relentless groove. Ruminating about the search for truth -- and coming to grips with the little white lies that we all are forced to live with, in varying degrees -- Rundgren lays down a heartfelt vocal performance, as smooth as honey and just as pure. Shades of Marvin Gaye can be heard in Rundgren's voice, coloring the sonic soundscape in shades of bittersweet acceptance. An album full of highlights, "Liars" includes the stunning "Stood Up", a no-holds-barred look at Rundgren's creative life-cycle, and featuring some of the most beautiful acoustic guitar playing ever committed to disk. The album's centerpiece, the sweeping ballad "Past", is a majestic nod to his "Second Wind" days, a symphonic masterwork of breathtaking, cinematic proportions. "Flaw" directs an angry stream of expletives towards an ex-lover, blissfully smoothed out over a candy-coated, Teddy Riley-inspired New Jack beat, cloaked in an extraordinarily catchy pop melody. "Afterlife", with its brutally frank lyrics, features a classic Rundgren chorus and a heartbreaking bridge with soul-wrenching, tear-inducing lyrics – an assured, masterful work possessing a magnitude and relevance not often heard in today's musical environment. Closing with the one-two punch of "God Said" (which contains the most interesting, potentially blasphemous lyrics regarding you-know-who since XTC's "Dear God", which, coincidentally, Rundgren produced back in the 80's) and "Liars" (with it's sinuous, eerily Arabic melody and fire-and-brimstone lyrics), Rundgren brings the album to a glorious, satisfying conclusion, leaving the listener with more questions than answers in the process – all the more reason to play the album again. And again. With "Liars", Todd Rundgren uncompromisingly cements his lofty position as rock's Last Remaining Relevant Icon, a '60's throwback who continues to progress, refine, and develop as an artist and musician, unlike many – if not most -- of his contemporaries. A true American treasure, Rundgren proves, once again, that the truth will, eventually, prevail.